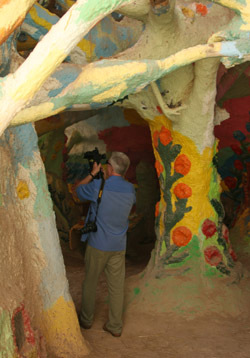 California's Gold was the first television program that ever featured Salvation Mountain. This episode of Huell Howser's Southern California television staple will show the original episode followed by the new show that shows just what Leonard has been up to and how the mountain has changed. 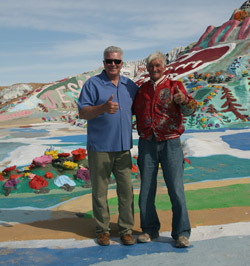 Everyone looks a little bit older but the message of Salvation Mountain is still as fresh and poignant as ever. Leonard and Huell. Filming inside the Museum. Huell at the top of the mountain. 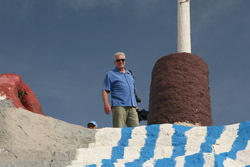 High above the desert floor that surrounds Salvation Mountain. Leonard's snowbird friends Merrill Harper and Corinne Latimer have returned to the Slabs once again this year from the ravages of Northern California. 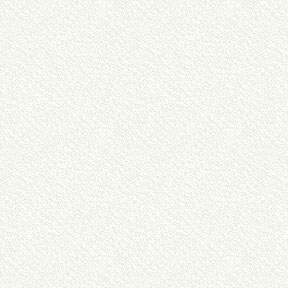 It was great to see them as always.